INTECSEA, working with Lockheed Martin and UTEC Geomarine, proposes a JIP focused on marine micropile technology with potential applications for conventional and ice/iceberg environments. 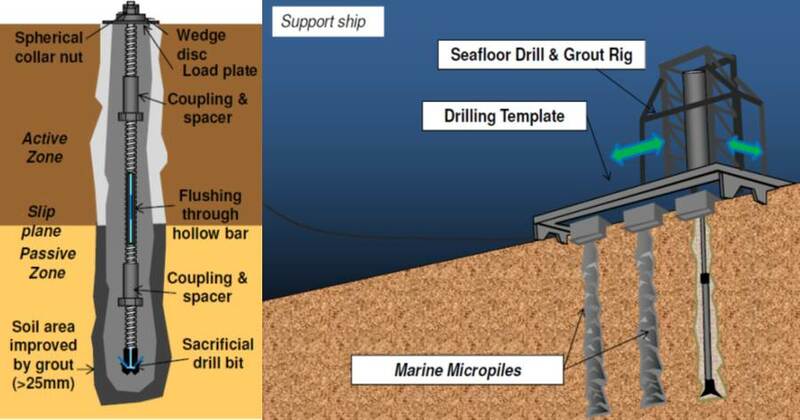 A group of one or more subsea micropiles, each with diameters around 100mm, are drilled into the seafloor from a seabed drilling rig and then grouted in place through a template, displayed below. The micropiles are designed to resist applied loads by bearing, uplift, and lateral reaction. The number of micropiles per group depends on the design loading. The micropiles consist of threaded hollow rods drilled into the seafloor at an adjustable angle and at variable lengths depending on the seafloor material and the required axial and lateral foundation fixation holding capacity. The micropiles may be pre-tensioned immediately following installation as a means of testing their capacity and significantly enhancing the lateral resistance of the foundation fixation assembly. Easier, and less costly, transport, handling, and storage of micropiles, given their smaller size, compared to traditional piles. An increased range of ice class vessels available for construction, due to the reduced minimum vessel size requirements, thereby extending the construction season. The collaborative group is assembling a JIP with the aim to qualify marine micropile technology for pipeline and anchor applications to allow it to be ready for offshore field trials, providing a more cost effective solution for a wide range of applications, at a time when the industry is in desperate need of innovative approaches. For more information on this JIP, please contact us at technology@intecsea.com.